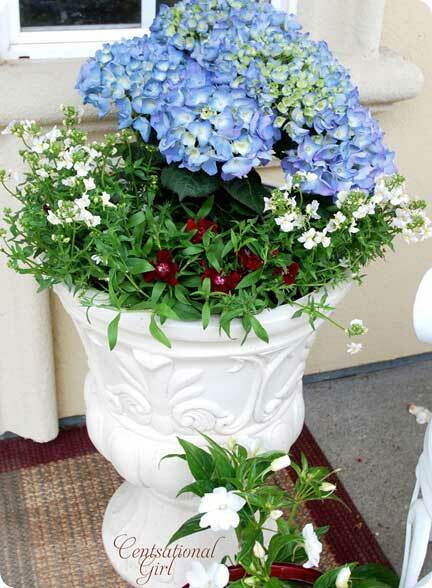 Really Make Her Front Porch Dazzle! 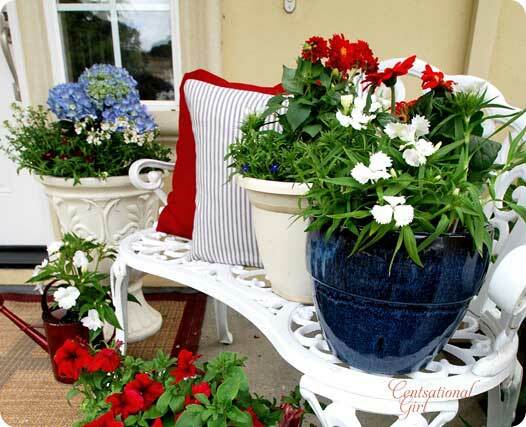 Kate's patriotic decorations serve beautifully for both Memorial Day decorations as well as the 4th of July. Kate is the highly regarded author of the blog Censational Girl. 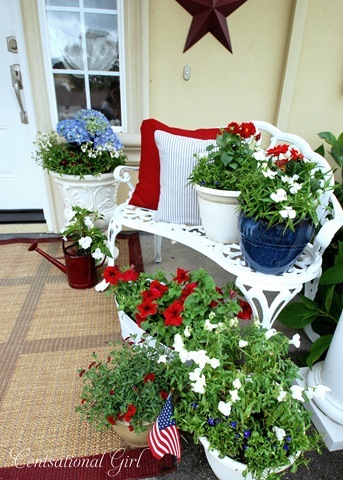 We really like how she used various combinations of red, white and blue flowers to carry her theme on her front porch. 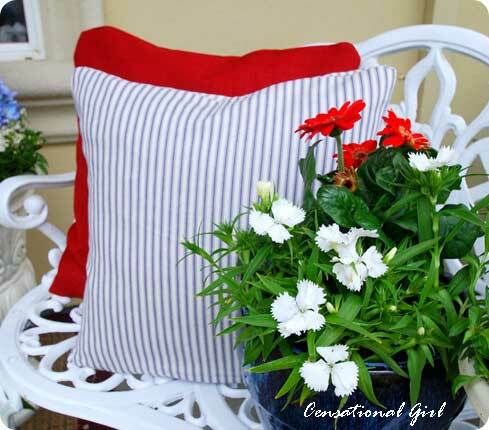 She also found inexpensive fabrics - red linen and blue and white ticking - to sew some pretty patriotic pillow covers. Wow! They turned out sooo nice. Kate says this summer she is enjoying adding punches of red to her porch. I love the dark red that's in her outdoor rug and the charming star that hangs on her home. And notice the cute red watering can. Love it! 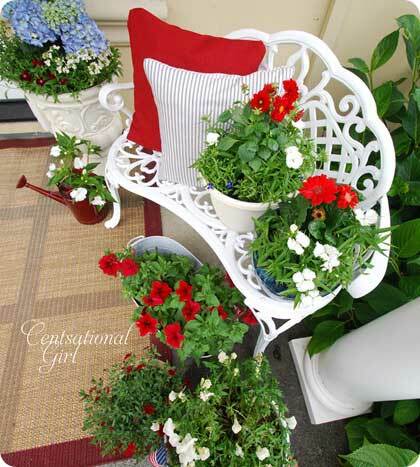 We agree, the red sure makes her porch "pop". We love her patriotic decorations - so fresh and festive. 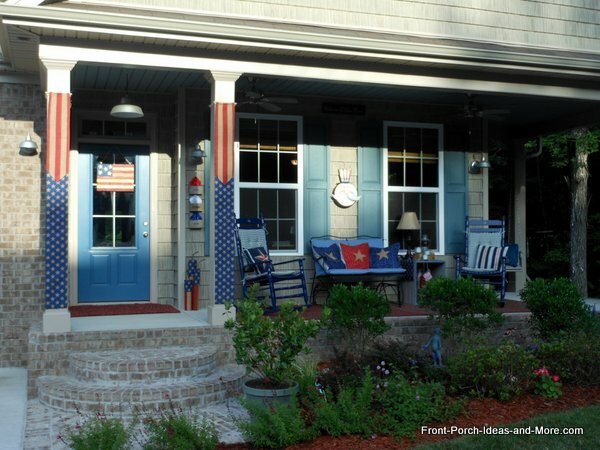 We really appreciate Kate sharing these fun pictures of her patriotic porch. We encourage you to visit her blog Censational Girl. As Kate says: "Three cheers for the red, white, and blue!" We couldn't agree more. Often times in our exuberance to celebrate with the U.S. Flag, people tend to forget how to properly display Old Glory. Here are a few friendly reminders when using patriotic decorations, specifically, the American Flag. When the U.S. Flag is displayed from a pole horizontally or at an angle from the porch, the stars should be located at the peak of the pole. The exception is when the the flag is at half-staff. When the flag is displayed horizontally or vertically against a wall, the stars (the union) should be at the top and to the flag's own right (or the observer's left). If displayed in a window the flag should be displayed in the same manner. The flag should never be used as bunting or draped over objects (except a casket). Do not allow the flag to touch the ground, shrubs, or other objects. The flag must be lighted when flown at night. When your flag is worn, torn, or otherwise should not be flown, it should be burned in a dignified manner. Contact your local scout troops or American Legion Hall for assistance. Do not throw the flag in the trash. Our patriotic American flag complements our other Americana decorations on our front porch. Instead of a typical wreath Mary and I chose to hang this wooden flag on our front door as a 4th of July decoration. 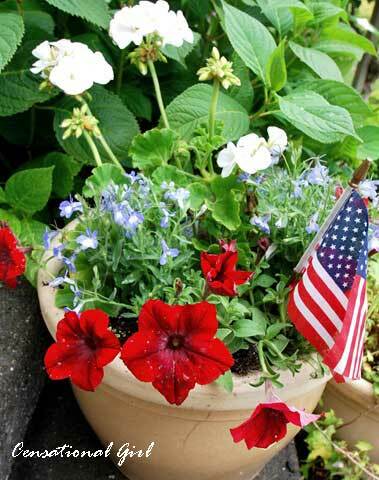 While it is an ideal 4th of July craft idea, our flag project can also be used throughout the year to celebrate many holidays like Memorial Day, Flag Day, and Veteran's Day to name but a few. 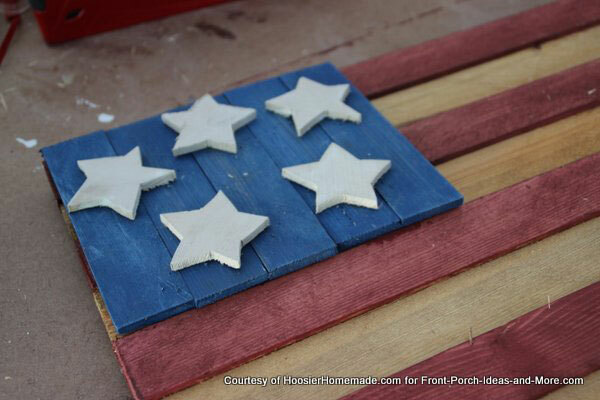 Americana decorations are very popular and pretty easy to make. You also have the option of making your flag larger or smaller to fit your own spaces. Versatile, you can also use the American flag indoors as patriotic home decor. Our flag measures 13 1/2 inches by 18 inches and is an ideal size for most front doors. However, you can easily make it any size you need. 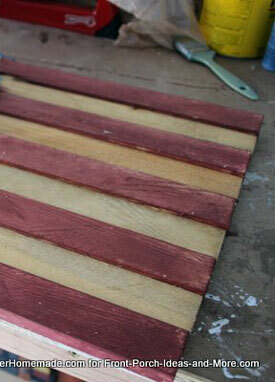 Our patriotic flag project can be made from scrap lumber or inexpensive materials from your local craft or hobby store. 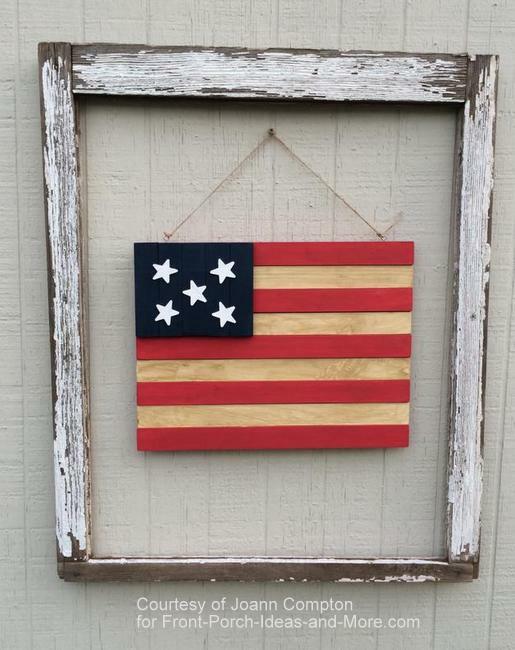 My friend Doug from HoosierHomemade.com and I actually made this flag from scrap lumber in no time at all, making it an ideal holiday project. Mary and I recommend you gather most of the materials listed below before you start. Sort through your scrap lumber and craft supplies to find wood for the slats and the right color of paints. 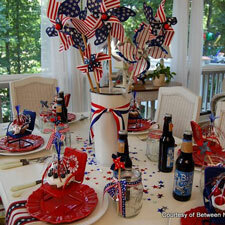 We used Americana colors which are more subdued than today's bright red, white, and blues. However, you can paint yours any style you'd like. 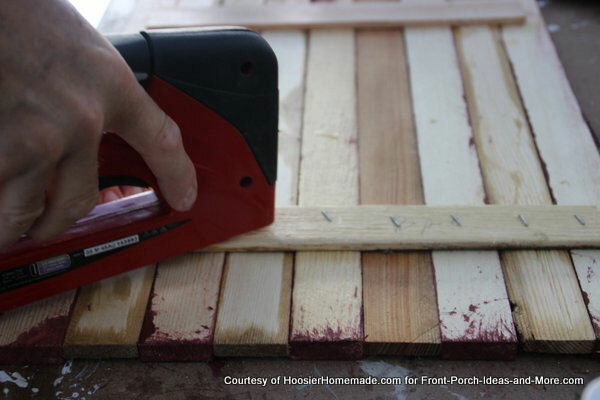 You can easily make the slats on a table saw with scrap wood (or purchase them at your local craft store). I used pieces of scrap 2x4s and cut them to the thicknesses as indicated below. We made them two different thicknesses to give the flag some depth; however, this is totally optional. 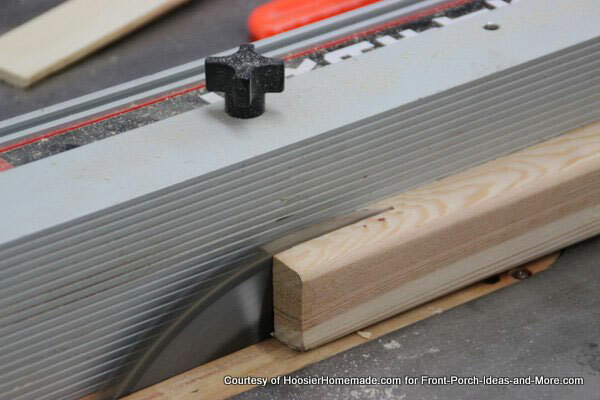 Wood spacers are only required if you opted to cut slats at two different thicknesses. Skip these instructions if using slats that are the same thickness. 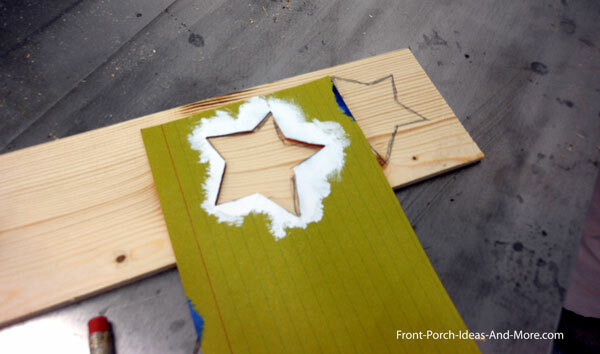 Make a star stencil approximately 2 x 2 inches from heavy paper, card stock, or cardboard. Or, you can purchase wooden stars at craft stores. Required for making your flag Americana colors; otherwise it is optional. 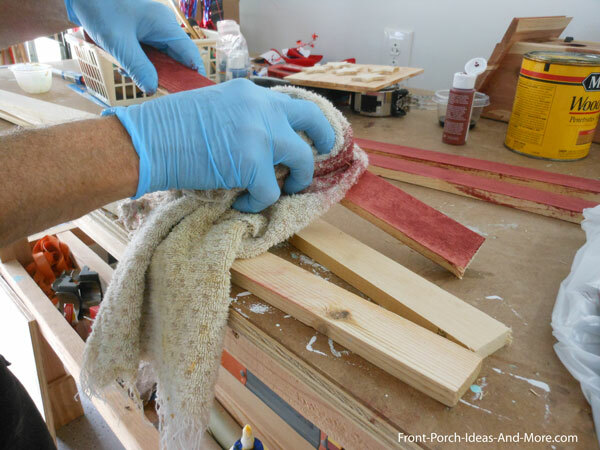 Begin by cutting wood to lengths and thicknesses as indicated above or purchase slats at your local craft store. Create star stencil and layout stars on wood. 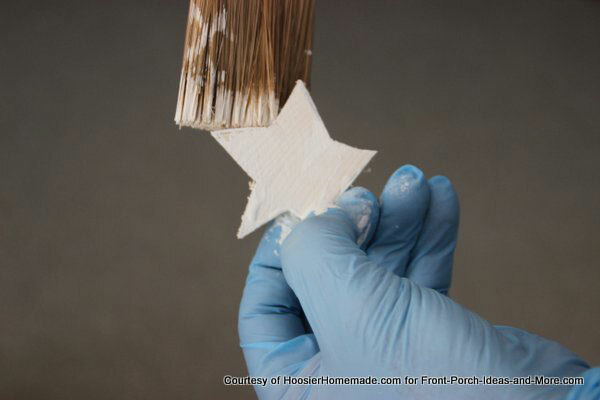 You could also either purchase a star stencil or purchase wood stars at a local craft store. 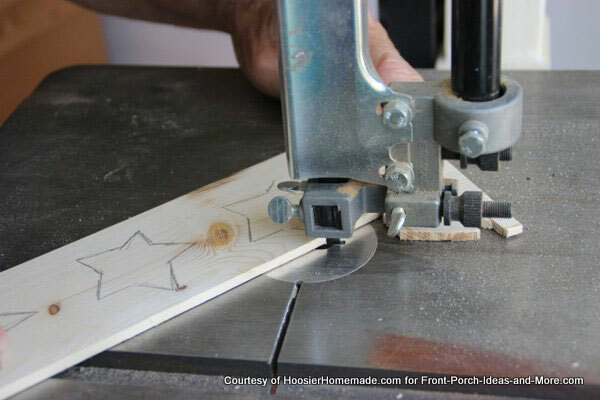 Cut out with jigsaw or band saw if making your own stars. Paint the stars white and let dry. Paint the five 1/2 x 1 1/2 x 18 inches barn red and let dry. Be sure to paint the edges of these as they will show during final assembly. Stain the four 3/8 x 1 1/2 x 18 inches golden oak and let dry. It may take two or more applications of stain to achieve the right color. Paint the five 3/8 x 1 1/2 x 6 inches navy blue and let dry. Begin by laying out the stripes. 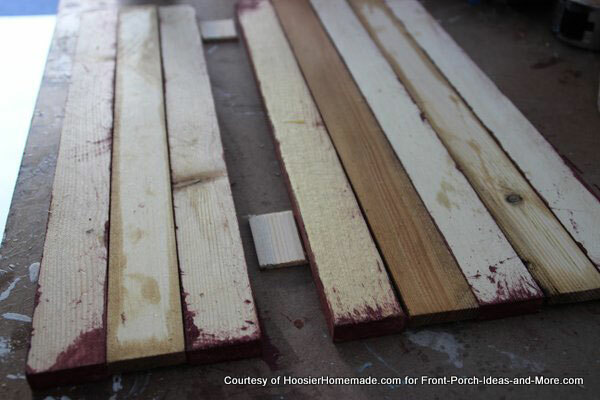 Place a red slat at the top and alternate with the stained one. If satisfied with the look, flip them over. 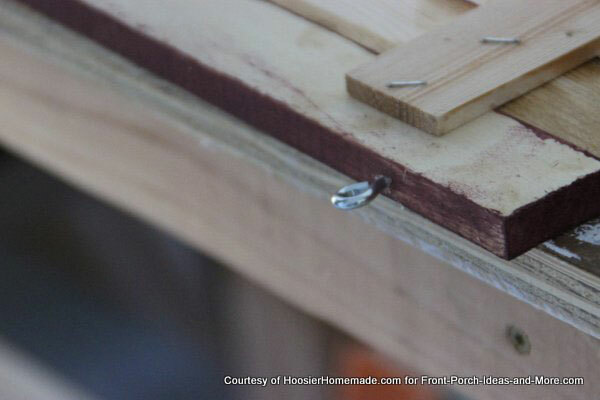 Place a 1/8 inch spacer beneath each stained slat to create a flat surface. Evenly space the two 3/8 (or 1/2 inches) x 1 1/2 x 12 inches pieces from the ends. Ensure they cover portions of the top and bottom flag slats. Staple them to the flag slats as shown. Position the five 3/8 x 1 1/2 x 6 niche slats vertically in the upper left corner to form the field of blue. Glue them in place. Position the stars as you find appealing and glue them in place. Let dry. Drill a small hole (or use a small nail and hammer) in top of the red slat near each end to create a pilot hole for the eye screws. Screw the eyes into the top of the flag. 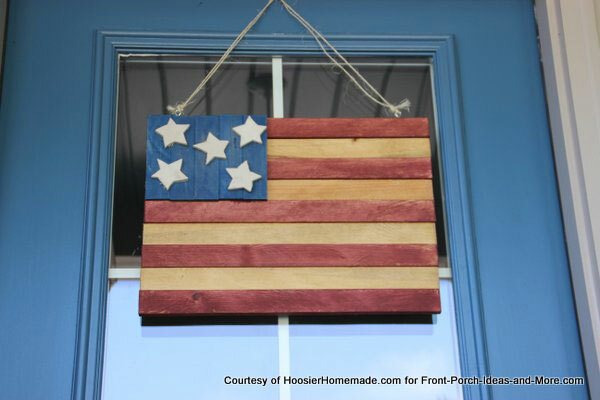 Tie a piece of twine to the eyes and hang your patriotic American flag on your front door! 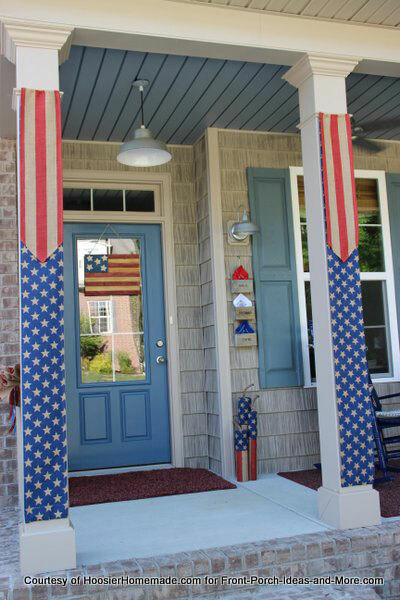 One of our FB readers, Joann, used our tutorial to make an American flag for her own home. Her husband cut the wood and she put it all together and did the painting. 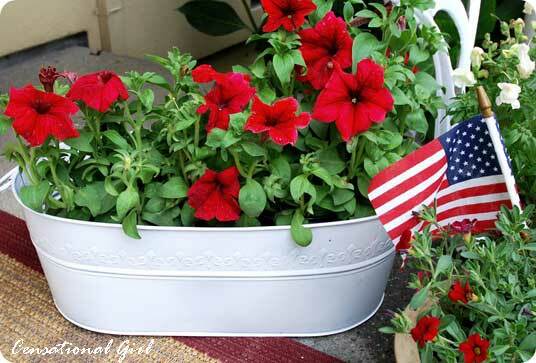 Will you also be making patriotic decorations for your porch? We had fun creating this Americana flag, just one of our patriotic decorations. 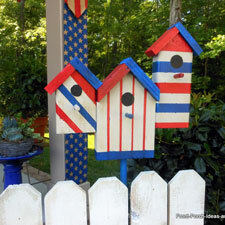 Discover our many other July 4th projects to use indoors or out like our Americana holiday firecrackers, decorative bird houses, and banners.